Fantastic for indoor use, they'll be joy and laughter all around thanks to the Chad Valley 6 in 1 Multi Games Table. Full to bursting with exhilarating options, this table (which has cool graphics) is sure to deliver great valued fun for everyone involved. 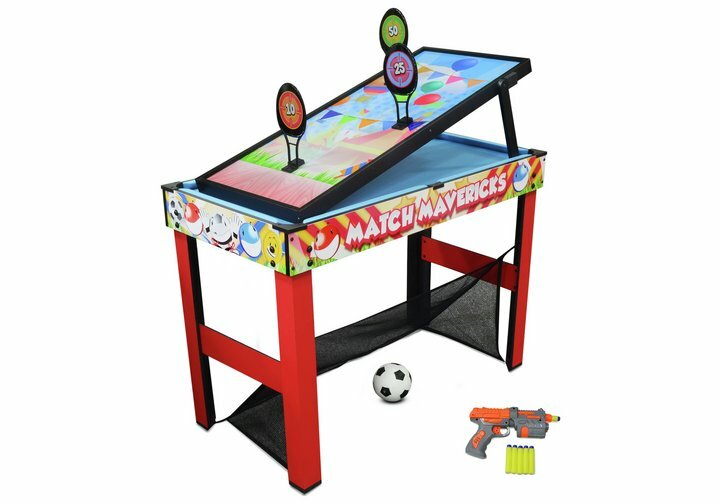 As the set contains a wide variety of popular classic game choices - pool, soft darts, push hockey, a football goal, a bean bag toss game and a target game - they'll be something ideal for every player regardless of ability; everyone can enjoy the fun! (Size L91.4, W45.7, H74.9cm; Weight 13kg). Get money off with April 2019 free Argos voucher codes, see if there's a discount code for the Chad Valley 6 in 1 Multi Games Table product. 4.8/5 from 26 recent reviews.